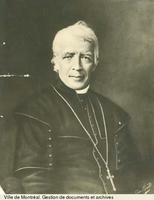 RACICOT, ZOTIQUE (baptized François-Théophile-Zotique), Roman Catholic priest, auxiliary bishop, and educational administrator; b. 13 Oct. 1845 in Sault-au-Récollet (Montreal North), fourth of the six children of François-Xavier Racicot, a notary, and Léocadie Tremblay; d. 14 Sept. 1915 in Sainte-Thérèse-de-Blainville (Sainte-Thérèse), Que., and was buried three days later in the crypt of the cathedral of Saint-Jacques in Montreal. 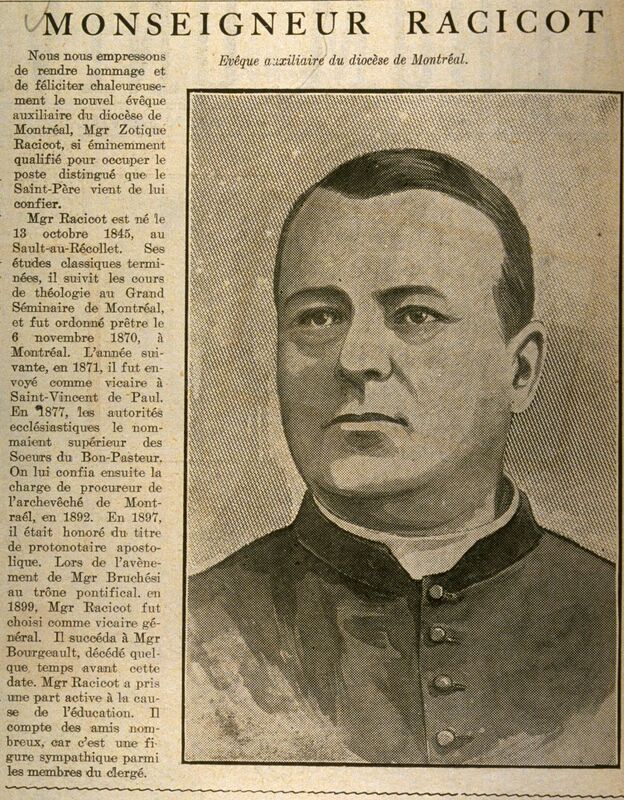 After taking the classical program at the Petit Séminaire de Montréal from 1857 to 1865 and doing theological studies at the Grand Séminaire, Zotique Racicot was ordained priest by Bishop Ignace Bourget* on 6 Nov. 1870. 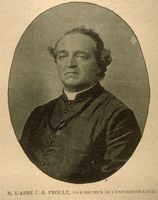 He served as assistant priest at Saint-Vincent-de-Paul (Laval) in 1870–71, Saint-Rémi (Napierville) in 1871–72, and Saint-Vincent-de-Paul again from 1872 to 1877. 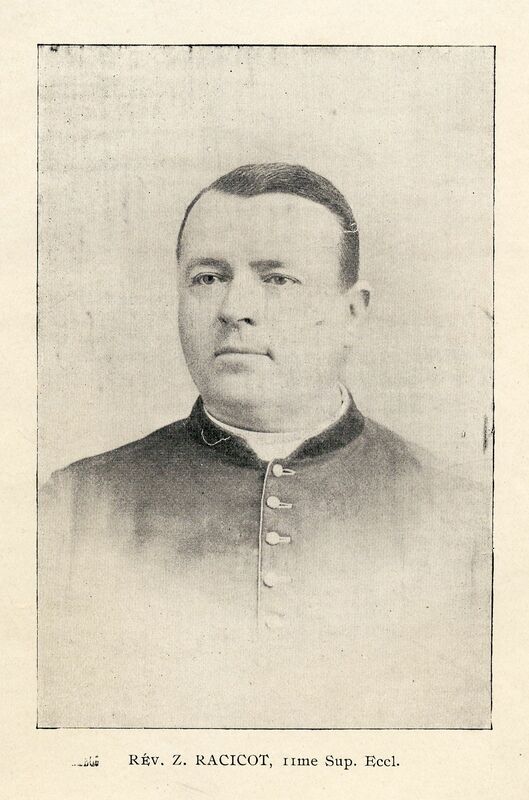 From 1877 to 1880 he was chaplain to the Sisters of the Good Shepherd (Angers). In carrying out these duties he demonstrated his administrative talents: he helped the community find funds for building the chapel at its mother house in 1878 and for its Académie Saint-Louis-de-Gonzague in 1880 [see Marie-Elmire Cadotte*]. He became the nuns’ ecclesiastical superior in August of the latter year. 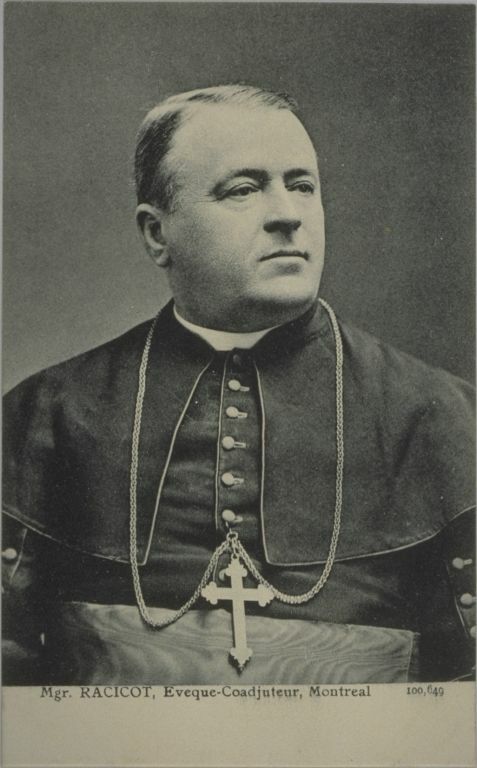 In 1880 also, Abbé Racicot was appointed procurator of the diocese of Montreal, which was being crushed by debt that in 1879 had reached $750,000, with interest exceeding $50,000 annually. The bishop, Édouard-Charles Fabre*, had been obliged that year to suspend construction of Saint-Jacques cathedral, which Bourget had initiated. Racicot resolutely set about restoring the finances of the diocese. In 1882–83 he put several of its properties up for sale, and in 1884 construction on the cathedral was resumed. The building would be opened for worship in 1893. 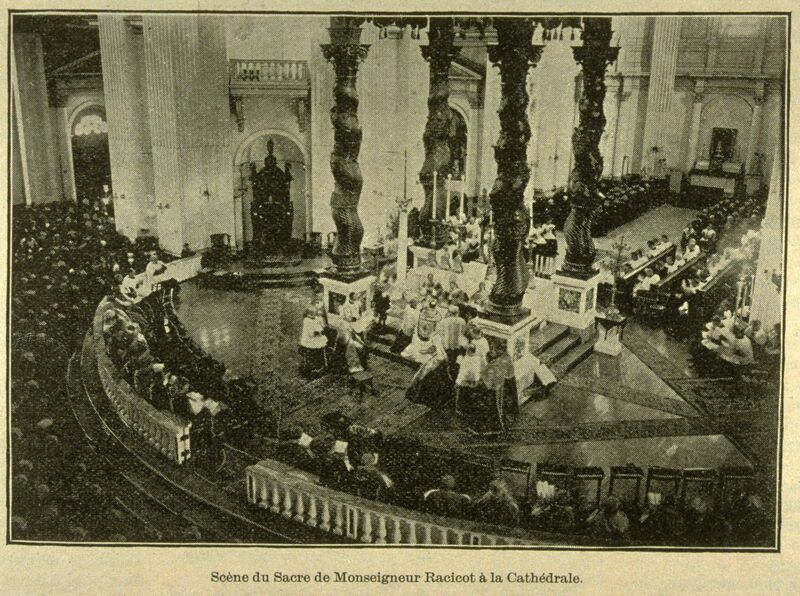 To finish it Racicot made heavy financial demands upon the parishes; he travelled around the diocese and gave sermons on the importance of the cathedral in the episcopal city as a monument and a legacy. 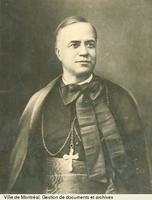 Racicot’s success in administering the diocese and completing construction work led Bishop Fabre to appoint him titulary canon and curé of the cathedral in 1891. 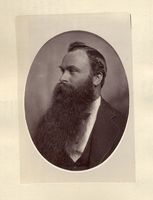 In February of that year he also was named to the financial corporation (soon to become the board of trustees) of the Université Laval in Montreal; he was amongst the university trustees who signed a petition in November 1893 to the premier of Quebec, Louis-Olivier Taillon*, requesting an increase in the provincial grant to the university. He chaired the board of trustees in 1893–94, and from the early 1890s he was in reality the archbishopric’s financial representative there. On 8 Oct. 1895 the Université Laval in Montreal opened its new building on Rue Saint-Denis, erected through grants from the Sulpicians and the unremitting efforts of vice-rector Jean-Baptiste Proulx*. Relations between the parent university at Quebec and its Montreal branch had been stormy, and Abbé Proulx did nothing to calm them. For the inauguration of the building it was arranged that the rector of Laval, Joseph-Clovis-Kemner Laflamme*, would be seated in the second row on the platform and that he would not address the guests; insulted, Laflamme left Montreal for Quebec on the eve of the ceremony. This conflict, coming after years of tension, led the bishops of the ecclesiastical province of Montreal to seek accommodation with Quebec. On 16 Oct. 1895 they chose Racicot as vice-rector in the hope that he would restore peace as well as assure proper management; he held the office until 10 Sept. 1901. During his term Racicot maintained good relations with the parent university while guaranteeing the autonomy of the Montreal campus. He was conscious, as he declared on 24 Oct. 1895, that “instead of the selection of a scientist, the choice was made of a man who has been dealing with business matters for many years, who has been acquainted with the institution’s budgetary difficulties from the beginning,” and he worked at establishing the university on solid financial bases. In his view, its primary needs were laboratories, libraries, and money. 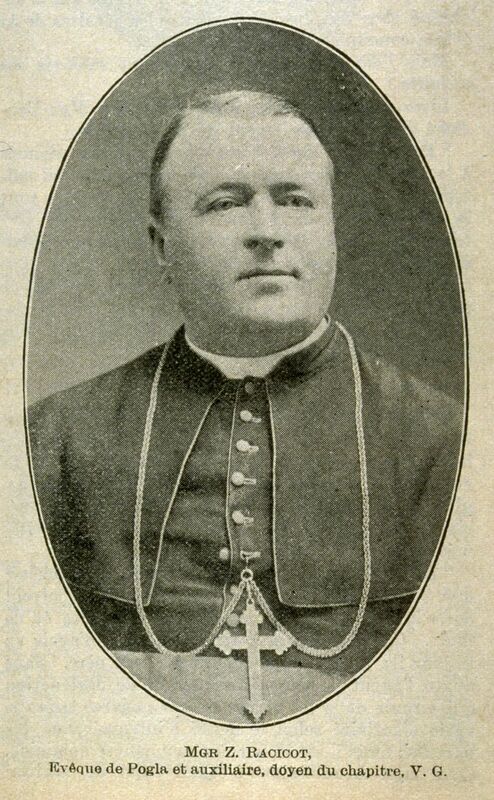 In July 1897 Racicot was named vicar general of the archdiocese by its new archbishop, Paul Bruchési*, who had complete confidence in his abilities as an administrator. On 27 June Racicot had succeeded Bruchési on the Roman Catholic Board of School Commissioners of Montreal, and on 24 August he became its chairman, an office he retained until March 1905. A reorganization in 1894 had given the clergy an important place on the board: three of the nine commissioners were priests. The archbishop continued to designate the chairman, who actually had limited powers and little freedom to act: once a month Racicot presided over the board meetings, and his was the deciding vote when there was a tie. In fact, from 1894 until 1917 the director general of schools, who was responsible for running the system, had the pivotal role. Racicot was named protonotary apostolic in 1899. After repeated requests from Bruchési the Vatican accorded the archbishop of Montreal an auxiliary. 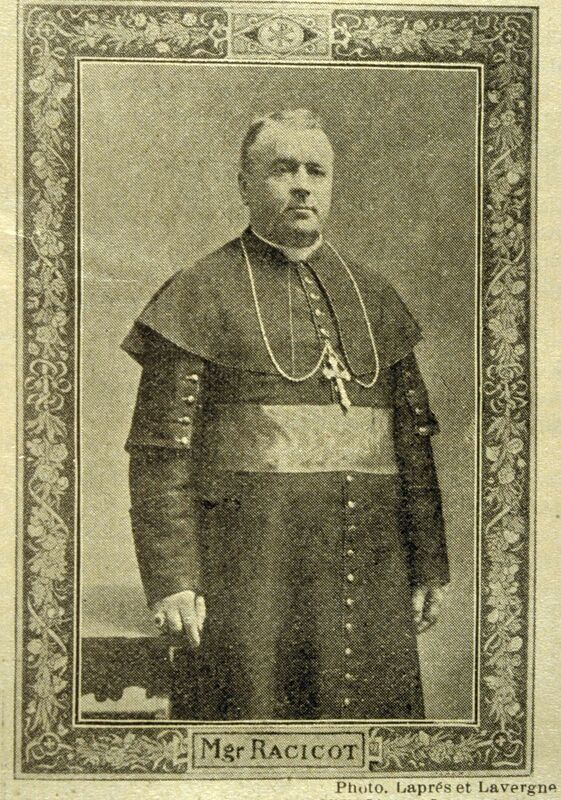 On 14 Jan. 1905 Racicot became titular bishop of Pogla and the first auxiliary bishop of Montreal; his episcopal consecration at the cathedral in Montreal was presided over by Bruchési, assisted by Archbishop Adélard Langevin of St Boniface, Racicot’s nephew, and Bishop Joseph-Médard Emard* of Valleyfield. 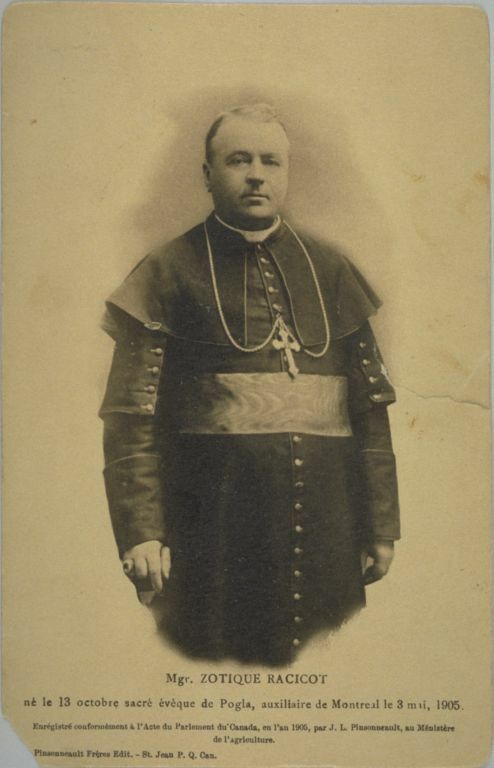 Closely linked with the development of the Université Laval in Montreal, Bishop Racicot became dean of the faculty of arts in 1905 and remained in that post for the rest of his life; he had been professor of ecclesiastical history in the faculty since 1897. His final years were sad. Hospitalized at the Hospice Drapeau in Sainte-Thérèse-de-Blainville until his death in 1915, he had been “living past his time for the last four years, in nervous prostration, retreat, and silence,” according to an obituary in La Semaine religieuse de Montréal. For more than three decades, from the end of the 1870s until the beginning of the 1910s, Zotique Racicot was familiar to and beloved by the people and clergy of Montreal. He was unquestionably renowned for his works. 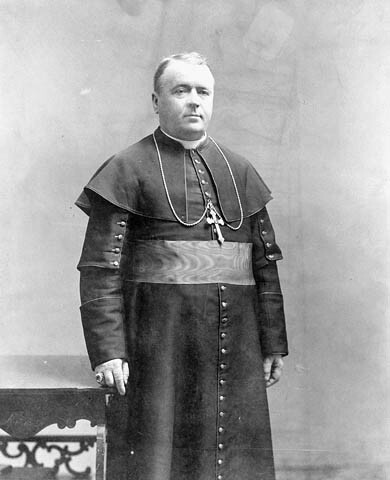 In assembling the resources to finish the cathedral, putting the finances of the archdiocese on an even keel, endowing the Université Laval in Montreal with the financial solidity it needed, and attending to the routine administration of the archdiocese as vicar general and auxiliary bishop, he showed himself to be an exceptional administrator. He complemented his archbishops, both Fabre and Bruchési, admirably. ANQ-M, CE1-4, 13 oct. 1845. Arch. de la Chancellerie de l’Archevêché de Montréal, 823.230 (vice-recteur); 879.100 (Commission des écoles catholiques de Montréal); 902.055 (fonds Mgr Zotique Racicot), .056 (sermons), .057 (nominations), .058 (décès). Arch. de l’Univ. de Montréal, P 3 (fonds Jean-Baptiste-Proulx); P 4 (fonds Zotique-Racicot); P 166 (fonds Univ. Laval). La Semaine religieuse de Montréal, 16, 20, 27, 30 sept., 4, 18 oct. 1915. Gérard Brassard, Armorial des évêques du Canada . . . (Montréal, 1940). “Courtes biographies des évêques coadjuteurs ou auxiliaires, des vicaires généraux actuels,” in L’Église de Montréal: aperçu d’hier et d’aujourd’hui, 1836–1986 ([Montréal, 1986]), 135. “Fen S. G. Mgr Zotique Racicot,” Les Cloches de Saint-Boniface (Saint-Boniface, Man. ), 14 (1915): 303–5. Renée Lescop-Baudoin, “Une étude du pouvoir officiel à la C.E.C.M. : les présidents de la Commission des écoles catholiques de Montréal de 1846 à 1965” (thèse de ma, univ. de Montréal, 1967). Rumilly, Hist. de la prov. de Québec, vols.7, 12. Marcel Lajeunesse, “RACICOT, ZOTIQUE,” in Dictionary of Canadian Biography, vol. 14, University of Toronto/Université Laval, 2003–, accessed April 26, 2019, http://www.biographi.ca/en/bio/racicot_zotique_14E.html.